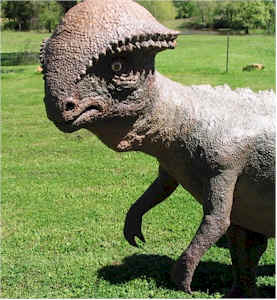 Stegoceras was one of the smallest members of the family that includes the more well known Pachycephalosaurus. Stegoceras had tiny teeth, which were not well suited for chewing fibrous plants that most herbivorous dinosaurs ate. It may have eaten leaves, seeds, and fruits instead. They had a fairly large brain, encased in a skull dome almost 3 inches thick. Although the skull was thick, it was porous and somewhat fragile, so some scientists believe it is unlikely that they butted heads as commonly as portrayed. Other scientists believe that head-butting was a common way for these dinosaurs to compete for mates, and to to defend themselves from predators. As a Stegoceras grew older, its dome overgrew the bony shelf on the sides and back of the skull, creating the appearance of a brimmed hat.